The Pit in collaboration with NADA will host a Summer Party on Saturday August 6th, which will also function as the opening reception for We Like Explosions. There will be DJ sets by artists, the release of a new artist book by Devon Oder, a food truck, drinks, and free limited edition We Like Explosions t-shirts for the first 100 people in attendance. In the first two years of The Pit’s existence we have been fortunate enough to work with many artists, writers, and curators. A foundational goal of The Pit has always been to focus on ideas and breaking down many of the traditional hierarchies found in the gallery system. 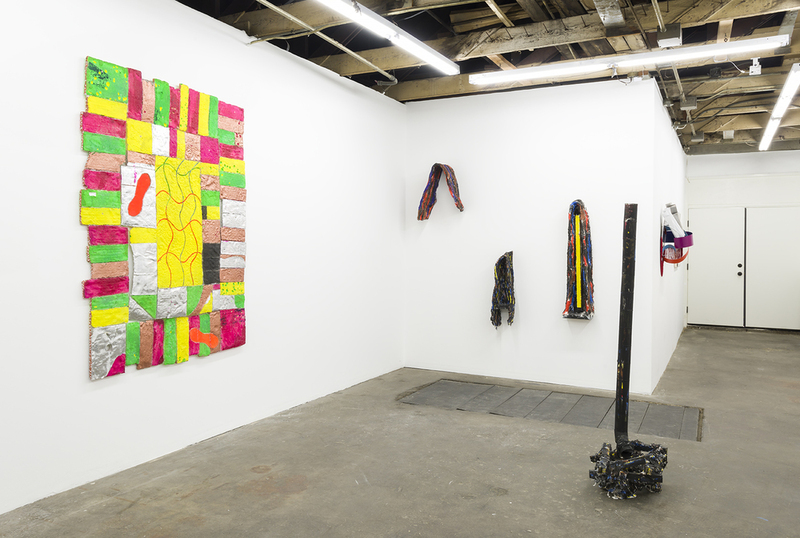 How can a gallery truly be a place for artists in all stages of their careers? As artists ourselves, what do we want from a gallery and how can we provide that for other artists? These are a few questions we continually find ourselves asking and trying to answer. After our first show The Outlanders opened in 2014, The Pit has been an explosion in our lives, and we like to think the energy created has been felt and appreciated throughout our community. We Like Explosions marks the beginning of our third year of programming. This show and this moment feel seminal to us for several reasons. This exhibition takes a turn from our usual method of curating in which group exhibitions are based on central themes running throughout the works shown in the gallery. We Like Explosions brings together 6 artists with a shared frame of mind, a feeling, an ethos, and it represents the future of The Pit. Going into our third year of programming we are delighted to announce the formation of a roster of represented artists who we will continue to work with into the future. This exhibition is a pinpoint in The Pit’s history, and marks an expansion in our program and direction. We will continue our mission of working with outside artists, writers and curators while fostering a community, which is open, accepting, and free of pretension. The Pit is an artist-run gallery meant to inspire other artists to walk their own path, create their own futures, and reject the status quo when it doesn’t satisfy them. Make your future | Make your scene | Make your own rules | We like Explosions! A full color perfect bound catalog will published in conjunction with the exhibition and will be released at an event at the gallery during the exhibition’s run. Adrianne Rubenstein (B. Montreal, Canada) lives and works in New York, NY and received a BFA from the Nova Scotia College of Art and Design and an MFA from San Francisco Art Institute. Her work has been exhibited in group shows at Regina Rex, New York, Canada, New York, Kansas, New York, and Derek Eller, New York with solo exhibitions at David Petersen, Minneapolis, Halsey McKay, East Hampton, White Columns, New York, and will have an upcoming solo exhibition at The Pit II in September of this year. As well, Rubenstein will be curating an exhibition with Venus over Los Angeles in the fall of 2016. Allison Miller (B. Evanston, Illinois) lives and works in Los Angeles, CA and received her BFA from Rhode Island School of Design, and an MFA from University of California, Los Angeles. Her work has been reviewed in ARTnews, Modern Painters, Flash Art, ArtSlant, Frieze, and the Los Angeles Times, among other publications. Recent and noteworthy exhibitions include Made in L.A. 2012 at the Hammer Museum Los Angeles, the Orange County Museum of Art, and the Torrance Art Museum. She has had solo exhibitions at Susan Inglett NYC, ACME LA, and will have an upcoming show at the Pit in November. Miller’s work is in the public collections of the Orange County Museum of Art Newport Beach CA and Santa Barbara Museum of Art CA. Erik Frydenborg (B. Miami, Florida) lives and works in Los Angeles and received a BFA from the Maryland Institute, College of Art, and an MFA from the University of Southern California. His work has been reviewed in Artforum, Flash Art, and the Los Angeles Times, among other publications. Frydenborg’s work recently has been exhibited in group exhibitions at Team Gallery NYC, M+B LA, and Shanaynay, Paris. As well, he has had solo exhibitions over the last few years with Andrew Rafacz, Chicago, Cherry and Martin, Los Angeles, and at The Pit. Florian Morlat (B. Munich, Germany) lives and works in Los Angeles. He attended the Kunstakademie Dusseldorf and received an MFA from the University of California Los Angeles. He has had solo exhibitions at Cherry and Martin LA, Galerie Ben Kaufmann Berlin, Daniel Hug Gallery LA, and Rowley Kennerk Gallery Chicago, among others. Recent group exhibitions have included The Pit, 11R NYC, MCA Santa Barbara, and Renwick Gallery NYC. Modern Painters, the New York Times, and the LA Times have reviewed his work. Morlat will have a solo exhibition with the Pit in early 2017. Nick Kramer (B. New York, New York) lives and works in Los Angeles and received a BFA from Bard College and an MFA from the University of Southern California. His work has been included in group exhibitions at LA><ART, Anat Egbi LA, and Canada NYC. He has also had solo exhibitions at Metro PCS LA, Anthony Greaney Boston, and at The Pit in 2016. Nick Kramer is a 2016 recipient of a Rema Hort Mann foundation grant for emerging artists. Nora Shields (B. Pittsburgh, Pennsylvania) lives and works in Los Angeles and received a B.A in Art History/ English Literature from the University Of Canterbury, Christchurch, New Zealand and an M.F.A from Art Center College Of Design, Pasadena. Her work has been exhibited in group exhibitions at venues such as JB Jurve, Los Angeles, Actual Size, Los Angeles and has recently has had a solo show at The Pit II titled “Int/Ext” in 2016. Erik Frydenborg - Blue Warp - 2016 - Polychromed Urethane - 52 x 14 x 3"
Nick Kramer - Another Wind of Rug - 2016 - Resin w/ Paint, Foil - 73 x 55 x 1"
Nick Kramer - Birthmarker 2 - 2016 - Resin w/ Paint, Foil - 55 x 53.25 x 1"
Allison Miller - Calendar - 2014 - Acrylic, Pencil and Modeling paste on Canvas - 60 x 52.25"
Allison Miller - Head / Edge - 2014 - Acrylic, Flashe, Pencil on canvas - 30 x 28"
Florian Morlat - Untitled (Cave 5) - Wood, Plaster, Burlap, Chicken Wire, Oil Enamel - 46 x 11 x 6"
Florian Morlat - Untitled (Cave) - 2016 - Plaster, Burlap, Chicken Wire, Oil Enamel - 19 x 25 x 11"
Florian Morlat - Untitled (Cave 6) - 2015 - Wood, Plaster, burlap, Chicken wire, Oil Enamel - 32 x 9 x 9"
Florian Morlat - Untitled (Bird Grammar 2) - 2016 - Wood, Plaster, Burlap, Cans, Oil Enamel - 65 x 23 x 20"
Adrianne Rubenstein - Purple Aura of a Person Inside a Campfire - 2015 - Oil on Panel - 34 x 25"
Adrianne Rubenstein - 90's Dress - 2015 - Oil on Panel - 32 1/2 x 24 1/2? Nora Shields - Corner Piece 3 (Halfbox) - 2016 - Acrylic, Plywood, Latex Enamel - Lacquer - 118 x 28 x .5"
Nora Shields - Untitled (Metal Relief) - 2016 - Acrylic, Stainless Steel, Fringe, Aluminum - 34 x 16 x 12"